We’re heading off on a week and a half-long vacation, first delivering this quilt in NY and visiting Carl’s family, then on to MO to visit my family. Forgive the photos, as we took them the night before leaving on our trip. Hope you’re having a wonderful time celebrating the holidays! 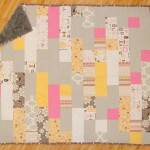 If I’m going to stick to a formulaic fabric selection, I thought I should at least mix up the shapes I’m using. However, a condensed timeline dictated simplicity, so I stuck with squares and rectangles. This stack of six fat quarters from Daisy Cottage; fat quarters of a generic pink solid, Kona Sunflower, and Fairy Frost in snow; and a yard of Essex Yarn Dyed in Flax went together quickly, but the values in the fabrics didn’t work out as well as the stack of blues and greens for the layout I used in Mustang Summing, so I mixed up the layout. “V’s Morse Message” (sideways, top is on right of photo), Rachael Arnold, December 2014, 48″x56″. Photo by Carl Pfranger. The result is a message to our new niece spelled out in Morse code, with the yarn dyed serving as spacers between letters and words. The whole thing is built on a 4″ finished grid, as I started with 4.5″ strips cut down into squares, 8.5″ rectangles, and 12.5″ rectangles. 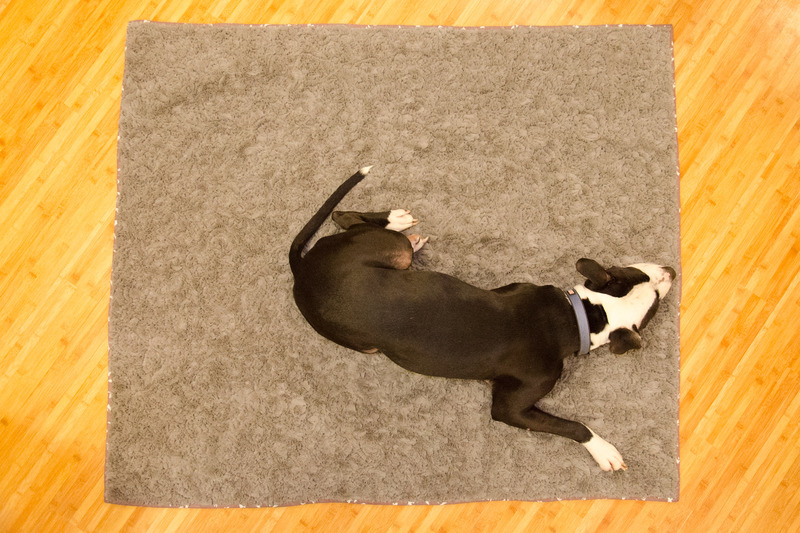 It finishes at 48″x56″. “V’s Morse Message” (detail), Rachael Arnold, December 2014, 48″x56″. Photo by Carl Pfranger. 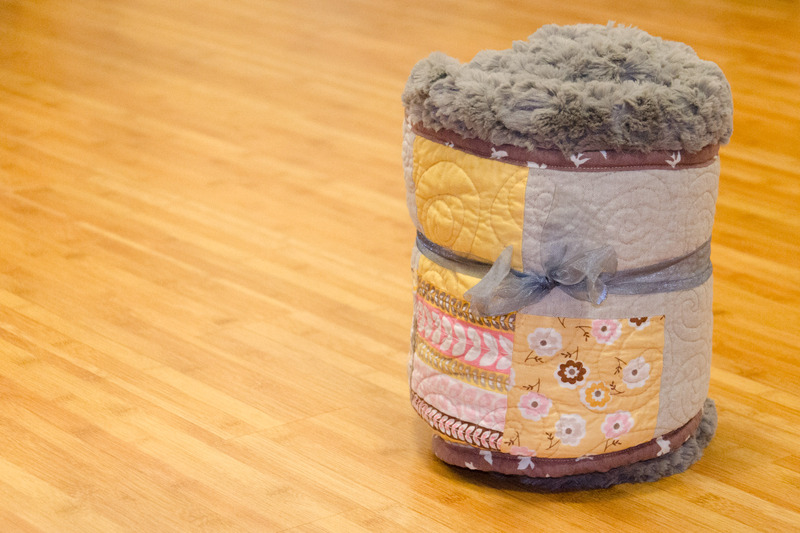 I feel bad admitting this, since the quilt became a gift (sorry, V! 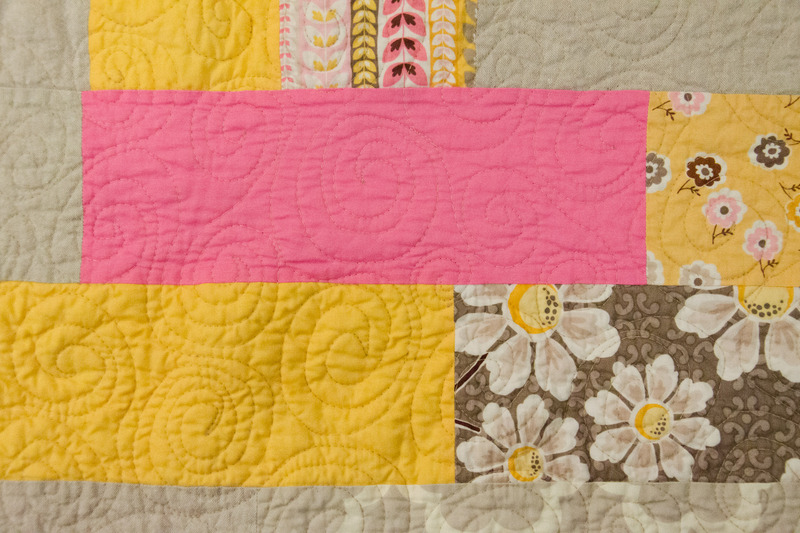 ), but I had such a hard time focusing on this quilt. I cut the fabric into strips soon after finishing Mustang Summing, but kept procrastinating on starting. Originally, I was going to make an equilateral triangle quilt. 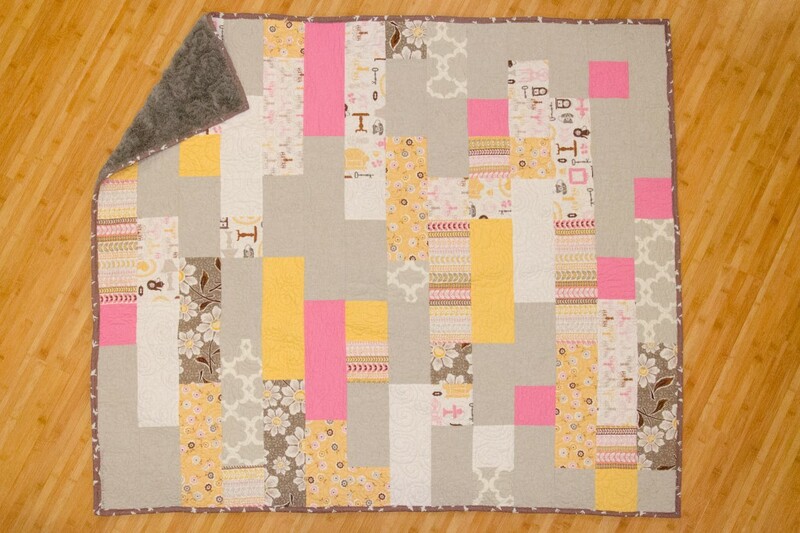 Then we found out a new niece was being added to the family, so it became her quilt. It took until the day she was born for the idea of Morse code to inspire me. Maybe I was just holding out for the spark. The back is nice and soft, courtesy Minky in the Dynasty pattern, oyster color (although the quilting hides the pattern). There’s low-loft cotton in the middle, as usual. I quilted it in an all-over swirl using Aurifil thread that I picked up from the local quilt shop. I forgot how much my machine loves this thread. The binding is a print from Brambleberry Ridge by Violet Craft. “V’s Morse Message” (back), Rachael Arnold, December 2014, 48″x56″. Photo by Carl Pfranger. Moof decided the back needed a little something extra for the photo. 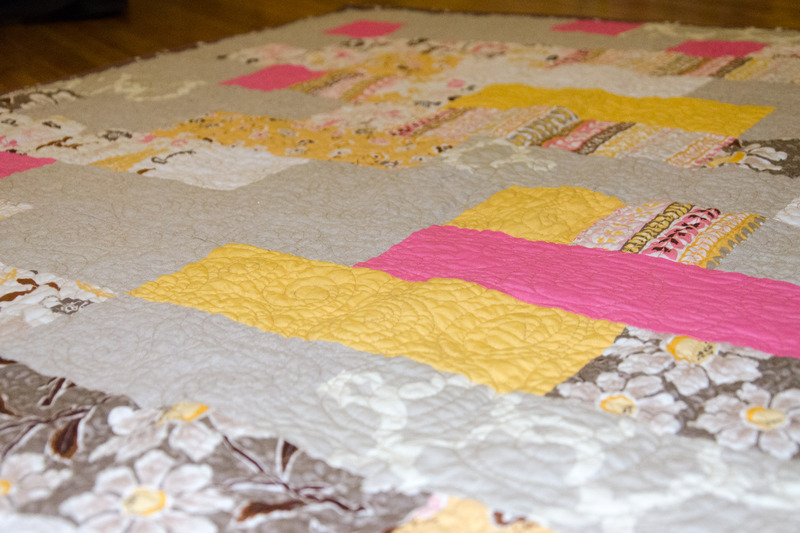 Since I didn’t expect to finish any more quilts in 2014, I didn’t have any labels to put on this one. For now, there’s a handwritten one on the front. Perhaps I’ll have to add another in the coming months once I order more. I hope the size of this can grow with her and keep her warm for years. Now I need to get started on quilts for her siblings!